Our beautiful home is nestled in the beautiful national forests surrounding St. Mary’s Glacier in the St. Mary’s/Winterland neighborhood. The natural setting allows for all sorts of outdoor activities. In the winter you can enjoy backcountry skiing, snowshoeing, snowboarding, snowshoeing, snowmobiling, or if you’re brave, you can give winter camping a try. When the snow melts in May, opportunities for hiking, mountain biking, 4x4 off-roading, backpacking and camping abound. The base of St. Mary's Glacier is one mile away. There are also two private lakes in the neighborhood that can be fished. The nearby quaint town of Idaho Springs boasts unique shopping and is rich in frontier and mining history. Try your luck at panning for gold after taking in a tour at one of the local mines. Run the rapids of Clear Creek with one of the several rafting companies right in Idaho Springs. Afterwards, soak in the hot springs and baths of Indian Springs. Or you can just spend the day shopping and visiting some of the several museums around town that are interesting for the entire family. There are several restaurants in Idaho Springs as well. BeauJo’s world famous pizza is an excellent choice or you can try one (or two) of the microbrews at Tommyknocker’s. After a long day of invigorating activity, shopping, or exploring, relax in our spacious two bedroom – two bath newly remodeled home. The living room has all of the comforts of home including a flat screen television with DirecTV and DVD player. If you’ve come to get away from the television, feel free to push the flat screen against the wall and forget it’s there. You can play some music, stretch out on the couches and enjoy the warmth of the wood-burning fireplace while reading your favorite book. The larger couch also folds out into a queen size bed. The beautifully updated kitchen has everything you’ll need to cook your favorite meals. Also downstairs is a full bathroom equipped with an amazingly relaxing rainforest shower head. Follow the aspen log staircase upstairs to the second bathroom and two bedrooms. The second bedroom sleeps two on a comfortable queen size bed and the master has a larger king size aspen log bed. From the master bedroom or the main entrance downstairs the large front deck can be accessed. Soak all your troubles away and enjoy the amazing scenery in the luxury hot tub situated on the deck. So get away for a while and stay in our wonderful home. It won’t be a vacation you’ll soon forget. This secluded cabin is our basecamp for both mountain activities and quiet downtime. There are six ski areas, historic mining towns, outlet stores and casinos just a short drive away. St. Mary's Glacier is a moderate one mile walk from the house and makes for a great day hike with incredible views. We end the day cooking dinner on the deck and relaxing in the hot tub under the trees. Our cabin has everything we need for a mountain getaway. The 400 sq ft deck has a hot tub, picnic table and gas grill with space for folding chairs. There is an outdoor fire pit with plenty of firewood ready for use. One mile from St. Mary's Glacier, Fox Mountain and the Continental Divide. St. Mary's Glacier, James Peak, Fox Mountain and Kingston Peak are just short walks from the cabin. Fox Mountain and the top of the Glacier are visible from the upstairs bedroom balcony. Towels for six people are provided. Fully furnished kitchen with pretty much everything you would find at home. There is seating for six at the dining table plus two more seats at the bar at the kitchen counter. One TV in the den. 400 sq. ft. private deck with hot tub, gas grill, folding chairs and picnic table. Fishing poles for the private stocked trout lake are available upon request. Year round hiking, skiing and snowboarding St. Mary's Glacier. Easy access to nine ski area along the I-70 corridor. We have stairs up to the front door and stairs up to the bedrooms. Please take a look a the pictures for a view of the stairs. New eight person hot tub on the secluded deck. Great cabin and really helpful owners! The cabin checked all the basic boxes, clean, well kept, well stocked etc. But on top of that, Glenn the owner was very helpful and responsive. Cabin is a great location for skiing and then enjoying the hot tub after a day on the slopes. Even got to see a moose along the road on way to cabin! The beds were really comfortable and we loved the hot tub. COZY, CLEAN , CONVENIENT AND WONDERFUL!!! The cabin had all we needed and more. The beautiful location and convenience to what we wanted to do was great. A great place and the hot tub after a day of skiing was perfect. The woodstove gave our family the coziness we totally enjoyed while being together on our getaway! 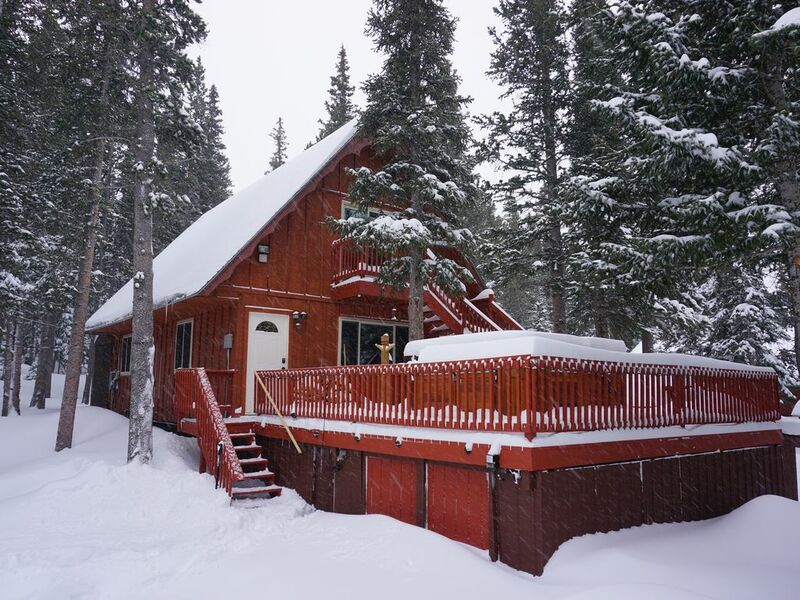 Cabin is above 10,000 feet elevation, tucked away down steep snowy roads with a beautiful view of the mountains. Be prepared with Auto Socks or chains for your vehicle if traveling during snow. Even the plow with chains had a difficult time getting up some of the roads. Very Nice cabin, my family enjoyed the stay very much. Cabin was well stocked with everything we needed. Grocery store is a 25min drive down a 12mile road winding road. The owner Glenn was super helpful and responsive! The nearby quaint town of Idaho Springs boasts unique shopping and is rich in frontier and mining history. Try your luck at panning for gold after taking in a tour at one of the local mines. Run the rapids of Clear Creek with one of the several rafting companies right in Idaho Springs. Afterwards, soak in the hot springs and baths of Indian Springs. Or you can just spend the day shopping and visiting some of the several museums around town that are interesting for the entire family. There are several restaurants in Idaho Springs as well. Beau Jo’s world famous pizza is an excellent choice or you can try one (or several) of the local microbrews at Tommyknocker’s and West Bound and Down.